The stadium is a bowl shape with four tiers on three sides of the ground; the lower and upper tiers being for general access, the second and third levels feed the second tier for premium tickets and the fourth tier for corporate boxes. The northern end of the stadium, due to its proximity to local housing, incorporates only the lower tier of the bowl. This end of the stadium is to be the away stand for football internationals. There is one basement level and seven storeys of floors including ground level. The premium level holds 10,000 spectators, while the box level holds 1,300. The remaining 38,700 seats are shared between the top and bottom tiers. The capacity of the stadium was criticised even before its opening for being too small, particularly in light of the large supporter attendance figures for Irish rugby internationals and football internationals at Croke Park since 2007. The stadium's roof undulates in a wave-like manner so as to avoid blocking light to local residences. The stadium was officially opened on 14 May 2010 by then Taoiseach Brian Cowen. In 2011, the stadium won a British Construction Industry Award. The Ireland national rugby union team plays its home games at the stadium, as it did previously at Lansdowne Road, taking over from their temporary home, Croke Park, where games were played during Aviva's construction. Ireland's first international game was on 6 November 2010 against South Africa, with the Springboks winning 23–21. The game drew a crowd of 35,515, mainly due to a backlash by Ireland supporters over the IRFU's controversial ticketing strategy for the November Test series. Initially, the IRFU announced that tickets to the November Tests would only be sold as packages for all four matches. Later, it announced that the tickets would instead be split into two packages, with the South Africa Test bundled with the following week's match with Samoa for a minimum of €150, and the New Zealand and Argentina Tests bundled for a minimum of €190. Single-game tickets were to be available only for the Samoa and Argentina Tests. On 1 November, the IRFU backed away from this plan amid heavy criticism from member clubs that had problems selling the packages in a difficult economy. The first rugby union game at the Aviva was an exhibition game on 31 July 2010, billed as the O2 Challenge, involving under-18 and under-20 players from all four of Ireland's provincial sides, with a Leinster/Ulster side defeating a Munster/Connacht combination 68–0. As part of the run-up to the event, O2 ran a promotion which gave the winner the opportunity to attempt to score the ceremonial first points at the Aviva via a simulated conversion kick on the day before the match. The winner of the promotion, John Baker of Ennis, was successful. The first official points at the Aviva were scored by Ulster's Craig Gilroy with a try in the O2 Challenge. The stadium also hosts some home games for Leinster when the RDS Arena's smaller capacity doesn't satisfy demand. Leinster won their opening home game in the Aviva against Munster 13-9, in the Magners League (now PRO12) season, in front of a then record Pro12 attendance of 50,645. This league record was exceeded on 29 March 2014 when Leinster again beat Munster, 22-18, in front of 51,700 people. Leinster won their first Heineken Cup game in the stadium 24–8, against Clermont Auvergne in a pool game during the 2010–11 season. During Leinster's successful run to the Heineken Cup title that season, they took their quarter-final and semi-final matches to the stadium, defeating Leicester Tigers and Toulouse respectively. Ulster took their 2012 Heineken Cup semi-final to the stadium as well, defeating Edinburgh. The 2013 Heineken Cup Final took place in the stadium on 18 May 2013 where Toulon beat Clermont Auvergne 16-15. The Heineken Cup final was last held in Dublin in 2003 when Toulouse beat Perpignan 22–17 at Lansdowne Road. The stadium also hosts the home games of the Republic of Ireland national football team, as did Lansdowne Road. The team had played most home games at Croke Park during the construction of the Aviva Stadium. The first soccer match in the Aviva Stadium was Manchester United against a League of Ireland XI side, managed by Damien Richardson, on 4 August 2010. Manchester United won the game 7–1, with Park Ji-Sung scoring the first ever goal in the Aviva Stadium. 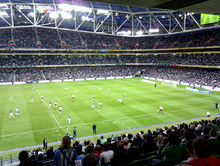 The first international game for Ireland in the Aviva Stadium was a 1–0 friendly loss against Argentina on 11 August 2010. The first competitive goal was scored by Kevin Kilbane in a Euro 2012 qualifying game on 7 September 2010 against Andorra. The Aviva annually hosts the FAI Cup Final, which was shared between the RDS Arena and the Tallaght Stadium while the Aviva Stadium was being built. The first Cup Final at the new stadium was the 2010 FAI Cup Final, held on Sunday 14 November 2010. Sligo Rovers beat Shamrock Rovers 2–0 on penalties after the game finished 0–0 after extra time. A total of 36,101 attended the game making it the biggest attendance at an FAI Cup Final since 1968. The 2011 Nations Cup took place in the Aviva Stadium. The tournament featured national football teams from Scotland, Wales, Northern Ireland and the Republic of Ireland. In the opening round of fixtures the Republic of Ireland beat Wales 3–0 while Scotland beat Northern Ireland 3–0. The remaining four fixtures took place in May, with the Republic of Ireland winning the tournament after beating Scotland 1–0 on 29 May, with Keane scoring the only goal. The 2011 UEFA Europa League Final between Portuguese sides Porto and Braga took place in the Aviva Stadium. Due to UEFA rules against corporate sponsorship outside the federation, the stadium was referred to as the "Dublin Arena" for this final, that ended with a 1–0 victory for Porto. The Dublin Super Cup was a pre-season football tournament which was held at the Aviva. Celtic, Manchester City, Inter Milan and a League of Ireland XI competed in the 2011 edition, with Manchester City winning the tournament. 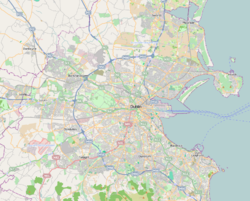 The 'Dublin Decider' was a game which took place on 10 August 2013. The match was played between Celtic and Liverpool, with both teams having large support in Ireland. Celtic won the match 1-0 thanks to a goal from Amido Balde. There were talks ongoing about a return of the 'Dublin Decider' in the summer of 2014 with clubs such as Barcelona, Manchester United and Celtic being mentioned as potential visitors to the Aviva Stadium. It was confirmed in March 2016 that Celtic will face Barcelona in the stadium on 30 July 2016, however this is as part of the annual International Champions Cup pre-season tournament, and not any sort of independent 'Dublin Decider' fixture. Barcelona won the game 3-1. On 19 September 2014, it was announced by UEFA that the stadium will host four Euro 2020 finals fixtures, three group games and a round of 16 match. Should Ireland qualify they will be guaranteed two home group games. On 1 September 2012, the stadium hosted an American college football game billed as the Emerald Isle Classic between the Notre Dame Fighting Irish and the Navy Midshipmen. Notre Dame won 50–10. The 2016 Aer Lingus College Football Classic was announced as a matchup between the Georgia Tech Yellow Jackets and the Boston College Eagles to be played on 3 September 2016. The result was a 17-–14 win by the Yellow Jackets. Siggins also co-authored the history of the previous stadium on the site, Lansdowne Road: The Stadium, The Matches, The Greatest Days (O'Brien Press, 2010). The stadium is served by public transport with Bus and DART. More remotely, it may also be reached, following by the Luas and on foot. The stadium is inaccessible by car on match days due to a 1 km car-free exclusion zone in operation. ^ "FAI can steer clear of Aviva turbulence". Independent.ie. Archived from the original on 17 February 2013. Retrieved 23 November 2014. ^ a b "Stadium Info". Aviva Stadium. Retrieved 25 November 2012. ^ "Final touches at Aviva for the American revolution". Independent.ie. Archived from the original on 17 February 2013. Retrieved 24 November 2014. ^ "Aviva Stadium - POPULOUS". Populous.com. Retrieved 24 November 2014. ^ "Scott Tallon Walker : Aviva Stadium". Stwararchitects.com. Retrieved 24 November 2014. ^ "RWC 2023 Host Selection Process Evaluation Report" (PDF). www.worldrugby.org. 2017. Retrieved 19 November 2017. ^ "Empty feeling not lost on O'Gara". Irish Times. 7 November 2009. Archived from the original on 10 November 2010. Retrieved 28 November 2010. ^ "IRFU Ticket Price Announcement". Irish Rugby Football Union (Press release). 29 November 2010. Retrieved 29 November 2010. ^ Gallagher, Paul (2 February 2009). "Lansdowne to be renamed Aviva Stadium". Irish Times. Retrieved 19 February 2010. ^ Hogan, Vincent (19 April 2010). "Vincent Hogan: Aviva — the most expensive second home in history". Irish Independent. Retrieved 24 November 2014. ^ "Kevin Myers: 'New stadium is an irreversible and huge tragedy for Irish sport'". Independent.ie. Retrieved 24 November 2014. ^ Harrison, Shane (14 May 2010). "Gates open at new national stadium". BBC News. Archived from the original on 17 May 2010. Retrieved 14 May 2010. ^ "Lansdowne Roar to live on at Aviva". RTÉ Sport. 14 May 2010. Archived from the original on 18 January 2012. Retrieved 24 November 2014. ^ "BBC News — Gates open at new national stadium". BBC News. Retrieved 24 November 2014. ^ "Sport-Dublin opens new Aviva stadium after three years". Reuters. Retrieved 24 November 2014. ^ "Winners 2011". www.bciawards.org.uk. 2011. Retrieved 14 December 2013. ^ "Ireland 46-24 Argentina". BBC Sport. Retrieved 24 November 2014. ^ "Leinster Rugby 21 v 28 ASM Clermont Auvergne". Ercrugby.com. Retrieved 24 November 2014. ^ "Ireland (0) 6 - 12 (6) England (FT)". ESPN. Retrieved 24 November 2014. ^ "Ireland (13) 13 - 13 (3) France (FT)". ESPN. Retrieved 24 November 2014. ^ Aimee Lewis. "Heineken Cup final 2013: Clermont Auvergne 15-16 Toulon". BBC Sport. Retrieved 24 November 2014. ^ "Ireland Rugby: Ireland make light work of Samoa". ESPN. Retrieved 24 November 2014. ^ "Ireland 15-32 Australia: Australia power past Ireland". ESPN. Retrieved 24 November 2014. ^ "Ireland 22-24 New Zealand: Last-gasp All Blacks break Irish hearts". ESPN. Retrieved 24 November 2014. ^ "Leinster v Northampton Saints at Lansdowne Road". ESPN. Retrieved 24 November 2014. ^ "Six Nations Rugby: Ireland ease past Scotland". ESPN. Retrieved 24 November 2014. ^ "Ireland 26-3 Wales: Superb Ireland lay down title marker". ESPN. Retrieved 24 November 2014. ^ "Ireland take big step towards Six Nations title". ESPN. Retrieved 8 March 2014. ^ a b "O'Driscoll try leads Leinster to hard-fought victory". Pro12. 29 March 2014. Retrieved 31 May 2014. ^ "Munster finally get the better of Leinster in Dublin as they storm to victory in the Aviva". Irish Independent. 4 October 2014. Retrieved 6 October 2014. ^ "Ireland v South Africa: Jonny Sexton stars as Ireland defeat Springboks 29-15 at Aviva Stadium". ESPN. Retrieved 24 November 2014. ^ "Ireland power past Georgia". ESPN. Retrieved 18 November 2014. ^ "Ireland hold on in Wallabies thriller". ESPN. Retrieved 23 November 2014. ^ "LEINSTER 14 V 13 HARLEQUINS". Leinster Rugby. 13 December 2014. Retrieved 3 October 2015. ^ "Sexton's Boot Guides Ireland To Hard-Fought Victory Over France". IRFU. 14 February 2015. Retrieved 15 February 2015. ^ "Henshaw's First Try Sees Ireland Overcome England". irfu. Retrieved 3 March 2015. ^ "Leinster do enough against Bath to reach semi finals". Irish Times. Retrieved 4 April 2015. ^ "A veteran bolter, farewells and missed tackle woes - 5 things we learned from Irish victory". Independent. Retrieved 16 August 2015. ^ "REPORT: Toulon turn on champions style". EPCR. Retrieved 9 October 2016. ^ "Sexton's late penalty earns Ireland a draw". rbs6nations. Retrieved 9 October 2016. ^ "Record-breaking Ireland bounce back in style". rbs6nations. Retrieved 9 October 2016. ^ "Ireland finish on a high in Dublin thriller". rbs6nations. Retrieved 9 October 2016. ^ "Canada". espnscrum. Retrieved 8 December 2016. ^ "New Zealand avenge Chicago defeat to cast Ireland aside". espnsrum. Retrieved 8 December 2016. ^ "Injury-ravaged Ireland add Wallabies to southern-hemisphere victims". espnsrum. Retrieved 8 December 2016. ^ "AS IT HAPPENED: LEINSTER V NORTHAMPTON, CHAMPIONS CUP". the42. Retrieved 18 December 2017. ^ "Ireland enjoy perfect homecoming against France". six nations rugby. Retrieved 19 October 2017. ^ "Ireland finish with a flourish against champions England : NatWest 6 Nations Championship". six nations rugby. Retrieved 15 June 2018. ^ "Leinster stay on course for Edinburgh return". epcr. Archived from the original on 9 May 2017. Retrieved 19 October 2017. ^ "Saracens march on to BT Murrayfield". epcr. Archived from the original on 27 April 2017. Retrieved 19 October 2017. ^ "Impressive Ireland run up record score against sorry Springboks". RTE. Retrieved 12 November 2017. ^ "Leinster Rugby 22 Exeter Chiefs 17". EPCR. Retrieved 16 December 2017. ^ "Leinster storm into Champions Cup semi-finals after victory over Saracens". epcr. Archived from the original on 2 April 2018. Retrieved 2 April 2018. ^ "AS IT HAPPENED: LEINSTER V SCARLETS, CHAMPIONS CUP SEMI-FINAL". the42. Retrieved 22 April 2018. ^ "Superb Leinster rally to big win over Bath in Dublin". EPCR. Retrieved 27 December 2018. ^ "O'Gara pleads with Ireland fans". ESPN. 7 November 2010. Archived from the original on 11 November 2010. Retrieved 7 November 2010. ^ "IRFU admits ticketing 'strategy error'". The Irish Times. 1 November 2010. Archived from the original on 5 November 2010. Retrieved 7 November 2010. ^ "Baker Boots His Way Into Record Books" (Press release). Irish Rugby Football Union. 30 July 2010. Retrieved 24 January 2011. ^ "Leinster overcome Munster in front of record crowd". RaboDirect Pro12. 2 October 2011. Retrieved 20 November 2012. ^ "Leinster 24-8 Clermont Auvergne". BBC Sport. 18 December 2010. Retrieved 20 November 2012. ^ "Leinster 17 Leicester 10: match report". The Daily Telegraph. London: Telegraph Media Group. 9 April 2011. Retrieved 20 November 2012. ^ "Leinster 32-23 Toulouse". RTÉ Sport. 30 April 2011. Retrieved 20 November 2012. ^ "Heineken Cup semi-final Ulster v Edinburgh: Just the ticket and 40,000 Ulster fans want one". Belfast Telegraph. 12 April 2012. Archived from the original on 19 April 2013. Retrieved 20 November 2012. ^ "Thousands celebrate Ulster rugby triumph". BBC News. 28 April 2012. Retrieved 20 November 2012. ^ "Heineken Cup final returns to Dublin in 2013" (Press release). ERC Rugby. 9 June 2011. Archived from the original on 11 June 2011. Retrieved 9 June 2011. ^ "Republic of Ireland 1 - 2 Serbia". Extra Time. 5 March 2014. Retrieved 11 March 2014. ^ "Brendan Rodgers: It's harder for Irish players to hit big time". Irish Independent. 15 May 2014. Archived from the original on 15 May 2014. Retrieved 15 May 2014. ^ "Republic of Ireland 1-2 Turkey". RTÉ Sport. 26 May 2014. Retrieved 27 May 2014. ^ "Rep of Ireland 2 Oman 0". BBC Sport. 3 September 2014. Retrieved 19 September 2014. ^ "Republic of Ireland 7 Gibraltar 0". BBC Sport. 11 October 2014. Retrieved 30 October 2014. ^ "As it happened: Derry City v St Patrick's Athletic, FAI Cup final". the42.ie. 2 November 2014. Retrieved 3 February 2015. ^ "Republic of Ireland". ESPNFC.com. Retrieved 24 November 2014. ^ "Long saves point for Ireland against Poland". uefa. Retrieved 16 August 2015. ^ "international friendly". espnfc. Retrieved 16 August 2015. ^ "Uefa qualifiers". UEFA. Retrieved 16 August 2015. ^ "Red Devils to face Airtricity League XI". RTÉ Sport. Raidió Teilifís Éireann. 12 May 2010. Archived from the original on 15 May 2010. Retrieved 12 May 2010. ^ "Airtricity League 1-7 Man Utd". BBC Sport. Retrieved 24 November 2014. ^ "Rep of Ireland 0–1 Argentina". BBC Sport. 11 August 2010. Archived from the original on 12 August 2010. Retrieved 11 August 2010. ^ "Ireland 3 – 1 Andorra". ESPN Soccernet. 7 September 2010. Archived from the original on 14 September 2010. Retrieved 8 September 2010. ^ "Ireland are Carling Nations Cup champions". Setanta Sports. 30 May 2011. Archived from the original on 22 February 2014. Retrieved 20 November 2012. ^ "Thousands of soccer fans flood city for Europa final". Herald.ie. Independent News and Media. 19 May 2011. Archived from the original on 17 February 2013. Retrieved 20 November 2012. ^ "Porto 1-0 Braga". RTÉ Sport. 19 May 2011. Retrieved 20 November 2012. ^ "Manchester City win Dublin Super Cup". Extratime.ie. 31 July 2011. Archived from the original on 6 April 2013. Retrieved 20 November 2012. ^ "Mario Balotelli back in favour as Manchester City rout Internazionale". The Guardian. London: Guardian News and Media. 31 July 2011. Retrieved 20 November 2012. ^ "Celtic win leaves Liverpool with more questions than answers". Guardian. 10 August 2013. Retrieved 15 May 2014. ^ "Football's coming home! Wembley Stadium to host Euro 2020 final as iconic London venue sees off competition from Munich to stage showpiece". Daily Mail. 20 September 2014. Retrieved 19 September 2014. ^ "History is made after capital chosen for Euro 2020". Irish Independent. 20 September 2014. Retrieved 19 September 2014. ^ "Notre Dame, Navy to face off in Ireland in 2012". Sports Illustrated. 21 September 2010. Archived from the original on 23 September 2010. Retrieved 21 September 2010. ^ "Jackets to Open 2016 Football Season in Ireland". ramblinwreck.com. ^ "'Mickey Bubbles' in Aviva first". Independent.ie. Retrieved 21 February 2019. ^ De-Burca, Demelza (17 December 2014). "AC/DC tickets sell out in less than 20 minutes". irishmirror. Retrieved 21 February 2019. 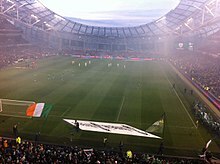 Wikimedia Commons has media related to Aviva Stadium.